A larva of the Indo-West Pacific lutjanid fish Macolor macularis Fowler, the Midnight Snapper, is described from a 6.0 mm (standard length) specimen, collected in the western Pacific Ocean (2�.1'S 158�.3'E). Although recently settled M. macularis have been described, this is the first report of a pelagic larva. The deep-bodied larva is typical of the perciform family Lutjanidae and is characterized by 24 myomeres, laterally compressed head and body, robust, long dorsal and pelvic-fin spines with fine serrations and strong head spination. The larva of M. macularis can be distinguished from the similar larvae of Macolor niger (Forssk錶) by having fin-ray counts of D X, 13 and A III, 10, the greater relative length of the second to third dorsal-fin spine and the lack of any opercular melanophores. 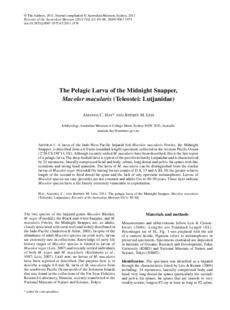 Larvae of Macolor species are rare, juveniles are not common and adults live to 40� years. These facts indicate Macolor species have a life history extremely vulnerable to exploitation.